During my Christmas trip to Florida I attended a party with New Zealanders and played a cajon box drum for the very first time. It is perfect for those awkward occasions in which you don't know the songs but would rather bang along than passively listen. As soon as I returned to Maryland I ordered one online as my first tax write-off of 2013. 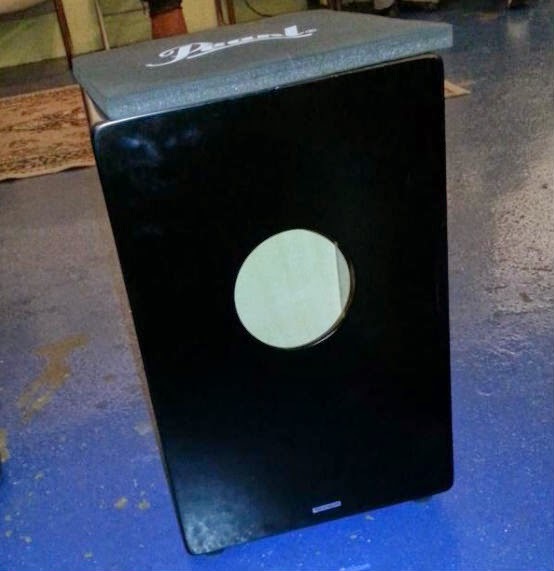 It is essentially a box you sit on that contains snares and has a sound hole in the back for projecting bass. It provides the sound of a drum kit without the need for hand/foot coordination. I have been taking drum classes at Drum for Joy in Takoma Park and hope to eventually attend some local drum circles as well. The best part of lugging around my drum is being asked if I am bringing my cat to work because its case looks like an animal carrier. And when one of the HR folks at the day job asked me what I was carrying I was able to emphatically respond "MY CAJON" without being asked to retake the sexual harassment webinar. This video of Heidi Joubert from Fernando's Kitchen will make you want a cajon as well. "1e+a 2e+A 3E+a 4e+a INDEED"!! Mark my words, the cajon is going to be the ukulele of drums!